Warning: Illegal offset type in isset or empty in highwire_markup_extract_variant() (line 1061 of /opt/sites/jnl-jabfp/drupal-highwire/releases/20190403222224/modules/highwire/highwire.include.markup.inc). From Tabula Rasa HealthCare, Moorestown, NJ (EJS, JT, OVK, CHK, KTB); Elmwood Family Physicians, Evesham Township, NJ (JP, PP, HS); Personalized Medicine & Targeted Therapeutics, University of the Sciences, Philadelphia, PA (AMI). Purpose: The purpose of this study was to implement a clinical pharmacist-led medication therapy management (MTM) service within a primary-care setting that is enhanced by 1) a clinical decision support system (CDSS) that includes a unique combination of medication risk mitigation factors, which aids the pharmacist in interpreting the medication profile, and 2) pharmacogenomics (PGx) testing. Methods: This was a service implementation study, whereby Medicare beneficiaries were eligible if they were patients of Elmwood Family Physicians, a private family, primary care practice with 2 locations in New Jersey, and were on at least 7 medications. Patients had a medication reconciliation completed by a pharmacist and performed a PGx buccal swab. Patient information was run through a CDSS to aid the pharmacist with screening for multidrug interactions and assessing patient’s medication-related risks. The output of the CDSS was used to create recommendations and provide a consult to the physicians. Recommendations were followed up by return of the consult. Results: Enrolled patients used a mean (± standard deviation) of 12.1 (± 4.6) medications. The turnaround time for the MTM Plus consults was 11.7 (± 6.2) days. During the consults, the pharmacist identified 138 medication-related problems (MRPs). 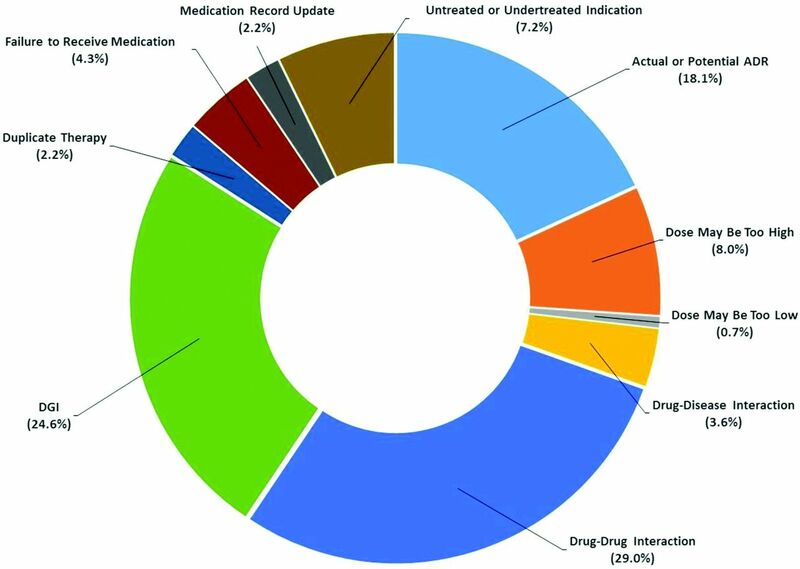 The most common MRPs were drug-drug interactions (29.0%) and drug-gene interactions (DGIs; 24.6%). Conclusion: Implementing a clinical pharmacist-led MTM Plus service in the primary care setting is feasible. This study highlights that DGIs are common in older adults in family practice and indicates that PGx testing identifies additional MRPs that may otherwise go unnoticed in these patients. The experiences we shared can aid other clinicians in establishing successful MTM Plus services. Future studies should also measure the impact of such personalized medicine services on economic, clinical, and humanistic outcomes. This study has been registered with ClinicalTrials.gov (study No. NCT02748148). One approach for reducing MRPs while optimizing medications for patients is medication therapy management (MTM) services. As medication experts, pharmacists have been providing MTM services throughout the United States since the enactment of the Medicare Prescription Drug, Improvement, and Modernization Act, which established a prescription drug benefit (ie, Part D) and required Prescription Drug Plans to offer MTM services to eligible patients commencing in 2006.9 Part D enrollees who had multiple chronic medical conditions (eg, chronic obstructive pulmonary disease, heart failure), took multiple Part D drugs, and were likely to exceed a certain threshold in annual costs (eg, $3138 in 2015) were considered eligible for these MTM services. Since the enactment of the act, a plethora of studies have found that MTM services effectively reduce potentially inappropriate medication use, drug-drug interactions, and medication nonadherence.10⇓⇓⇓⇓⇓⇓⇓⇓⇓–20 However, a recently conducted systematic review of the cumulative evidence during the last decade showed that there is substantial variation in the performance of MTM services across Prescription Drug Plans.21 Furthermore, according to Centers for Medicare & Medicaid Services, the current landscape is that Prescription Drug Plans are delivering MTM services only at a level necessary to meet the minimal government requirements (eg, eligibility criteria, completion rates), and these models are not well aligned with government quality improvement and financial interests, given that a significant proportion of Prescription Drug Plans have not definitively proven that their MTM services improve patient outcomes and/or reduce Medicare expenditures.22 Notwithstanding these shortcomings, pharmacist-provided MTM services are commonplace in clinical practice. Still, enhanced MTM services provide opportunities to improve outcomes and/or reduce expenditures thereby overcoming these shortcomings. However, first and foremost, feasibility assessments for enhanced MTM services are needed. The practice setting was Elmwood Family Physicians, a private family, primary care practice with 2 locations in New Jersey (Marlton and Tabernacle). At each location, the practice is staffed with 3 PCPs, 1 nurse practitioner, 2 physician assistants, a nurse manager, and 3 medical assistants. The practice also is a training site for students of various disciplines (eg, medicine, pharmacy). Although there is not a staffed pharmacist at the practices, there is a pharmacist available to assist with training pharmacy students. In addition, for this study, a research pharmacist (postgraduate year 1 resident) was on site approximately 3 days per week for approximately 4 to 6 hours per day. The practice serves approximately 5000 patients and has approximately 1400 office visits per month. Flowchart of patient eligibility and enrollment process. In March 2016, the onsite research pharmacist reviewed 626 patient charts to determine eligibility for enrollment in the study. Among patients screened, 185 met inclusion criteria. However, approximately 50% of the time, either the pharmacist or patient was not available for informed consent. Among the 92 remaining eligible patients, 42 were excluded from enrollment in the study for various reasons. A total of 50 patients were enrolled and received medication therapy management (MTM) Plus services led by the pharmacist. In March 2016, the research pharmacist began reviewing charts of the practice sites’ electronic health records to determine potentially eligible patients, and in April 2016, enrollment commenced. When the research pharmacist was on site, she collaborated with staff to introduce the consent process to potentially eligible patients and to ascertain whether these patients were experiencing any MRPs around the time of the scheduled PCP appointment. Immediately following the PCP appointment, the research pharmacist visited with eligible patients in their examination rooms to obtain informed consent. Once consent was obtained, the patient was enrolled onto the study and assigned a random research number. The research pharmacist then started the MTM Plus process. The MTM Plus process is depicted in Figure 2. Medication reconciliation was performed by the research pharmacist by first obtaining the patient’s prescription medication history from a third-party source (Cerner Medication History; Cerner Corporation, Kansas City, MO), then comparing that list to the medication list obtained from the patient’s medical chart at the practice site, and finally reviewing the unreconciled lists of medications directly with the patient. The final medication list was based on the patient’s self-reported medication use, whereby the research pharmacist reconciled medication discrepancies with the patient and subsequently, via the MTM Plus consult (Appendix 1), brought to the PCP’s attention. Medication adherence was assessed by the research pharmacist by using a validated, 4-item, self-reported medication adherence scale.33 Patient responses are categorized as “yes/no” for each item and tallied for a total. A total score of “0” indicates high adherence, a score of “1 to 2” indicates medium adherence, and a score of “3 to 4” indicates low adherence. Medication Therapy Management (MTM) Plus process workflow. 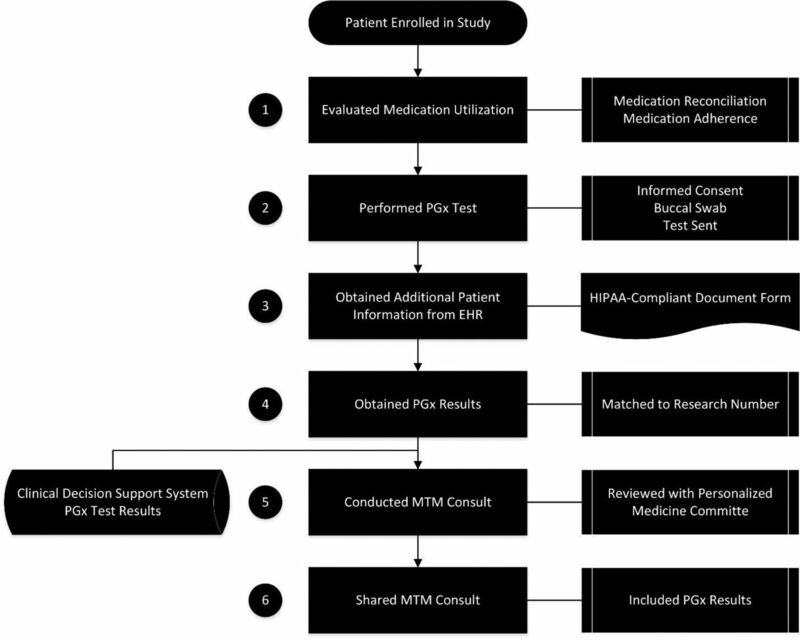 The MTM Plus process workflow employed the following steps: 1) evaluated medication utilization by performing medication reconciliation and assessing medication adherence; 2) performed PGx test by conducting informed consent specifically for the test, observing patient perform buccal swab for PGx test, and sending PGx test to laboratory with deidentified research number; 3) obtained additional patient-specific information from the EHR to inform the consult and documented this information into a secure, HIPAA-compliant form; 4) obtained PGx test results and matched them up to patient deidentified research number; 5) conducted consult, which was informed by clinical decision support data and PGx test results, and reviewed recommendations with a subgroup of a personalized medicine committee; and 6) shared consult, including PGx test results, with PCP. Abbreviations: EHR, electronic health record; MTM, medication therapy management; PCP, primary care physician; PGx, pharmacogenomics. The research pharmacist timed and observed patients perform a buccal swab for DNA collection using a PGx testing kit from Coriell Life Sciences (Camden, NJ). The kit cost approximately $300 and included a panel of genes associated with the metabolism, transport, and targets (eg, receptors) of numerous medications. Specifically, the genes included in the PGx testing kit were CYP2C9, CYP2C19, CYP2D6, CYP3A4, CYP3A5, CYP4F2, VKORC1, SLCO1B1, TPMT, ATM, F2, F5, MTHFR (A1298C), and MTHFR (C677T). Following DNA collection, buccal swab samples were sent directly to a Clinical Laboratory Improvement Amendments–certified laboratory (eg, Gene Trait Laboratories, Columbia, MO) for testing. Subsequently, Coriell Life Sciences received the test results from the laboratory, and interpreted the reference single nucleotide polymorphism (rs) numbers to genotypes and phenotypes. These results were sent to CareKinesis via a Secure File Transfer Protocol. Information about patients’ medications was not shared with the laboratory or Coriell Life Science. Following these steps, the research pharmacist entered each patient’s final medication list and medication adherence category (eg, low, medium, high) into a secure, HIPAA-compliant form (Google Docs; Google Inc., Mountain View, CA). In addition, the research pharmacist collected other information about the patient from the medical chart, including demographics, pertinent biometrics (eg, height, weight) and clinical metrics (eg, blood pressure, heart rate), and laboratory data (eg, lipid panel, serum creatinine), as well as medication allergies and reported MRPs (if applicable). This information was also entered into the secure, HIPAA-compliant form. All information collected and entered into the form was deidentified to ensure protection of patient confidentiality. Finally, once the research pharmacist received the patient’s PGx test results she matched the results back to the patient’s research number for identification and interpretation. Using the output of the CDSS and guidance from clinical practice guidelines, such as those for diabetes35 and heart failure36,37 as well as specifically for PGx38, the research pharmacist performed a consult. In performing the consult, the research pharmacist focused on identifying actual and potential MRPs for each patient and providing recommendations for the PCP to resolve MRPs and mitigate medication risks. The consult was reviewed by a subgroup of a personalized medicine committee before sharing with the patient’s PCP. The subgroup was composed of 2 senior pharmacists with expertise in MTM, geriatric pharmacotherapy, and PGx. The purpose of the subgroup’s review was to guide the research pharmacists’ recommendations because she was in residency training at the time of this study. After the subgroup reviewed and approved the consult, the research pharmacist sent it to the PCP’s designated nurse by a secure (encrypted) electronic email message (Microsoft Outlook; Microsoft Corporation, Redmond, WA), along with an electronic copy of the patient’s PGx results. In addition, the research pharmacist created a “gene card” (Appendix 2) that summarized the PGx results for the patient. Like the consult, the gene card was securely emailed to the PCP’s designated nurse; and, subsequently, the nurse mailed the gene card to the patient’s home. In cases where severe or life-threatening MRPs were identified, the research pharmacist spoke directly with the patient’s PCP, in person, whereby changes were implemented as swiftly as possible. In other cases, the PCP reviewed the consult in written form, typically before the patient’s next scheduled appointment, responded to the research pharmacist’s recommendations by checking a box indicating a response (eg, “accept recommendation”), and signed the consult. In turn, the research pharmacist either picked up the signed consult when she was back in the PCP office or an electronic copy was sent to her by office staff. Lastly, if the consult resulted in medication changes being implemented by the PCP, either office staff or the PCP communicated the intended changes directly to the patient. Although no formal assessment of the MTM Plus service implementation was conducted, to optimize integration of the process into the primary care practices’ workflow, the research pharmacist actively engaged the PCPs and office staff for feedback. In doing so, the research pharmacist was prepared to make changes to the process to ensure successful implementation of the MTM Plus service; albeit, no suggestions were made and thus the MTM Plus service remained as described (Figure 2). This study was approved by the Biomedical Research Alliance of New York Institutional Review Board (IRB), and is registered with ClinicalTrials.gov (study No. NCT02748148). Funding was provided by Tabula Rasa HealthCare. PGx testing was provided to patients at no charge. Characteristics of the 50 patients enrolled onto this study are provided in Table 1. Their median (interquartile range) age was 69.5 (65.0 to 75.8) years, and 54% were male. According to the final medication list, patients used a mean (± standard deviation) of 12.1 (± 4.6) medications, and the most frequently used medications were aspirin (50%), vitamin D (48%), and atorvastatin (46%). Regarding medication risk mitigation factors, most patients had a relatively moderate risk for cognitive burden and falls. Among the eligible patients (n = 92), the majority (54%) consented to enroll onto the study (Figure 1). Of the 42 patients who did not enroll, 43% did not make their scheduled appointment, and 52% declined to participate. Most of the eligible patients who declined to participate indicated that they did not have sufficient time to complete the informed consent. The turnaround time for MTM Plus services was 11.7 (± 6.2) days. This included the time required for the research pharmacist to create the consult as well as the time required for the subgroup of the personalized medicine committee to meet, review, and agree on the consult recommendations. Early in the implementation phase, it took approximately 14 days (up to 19 days) to complete a consult. However, as implementation progressed, it took approximately 3 days (up to 5 days). On average, it took 23 (± 11.4) days for the research pharmacist to receive a response to the consult from a PCP. The research pharmacist identified 2.8 (± 0.9) MRPs per patient (range, 1 to 4), for a total of 138 MRPs for the 50 patients enrolled in this study. The types of MRPs identified and recommendations made by the research pharmacist are depicted in Figure 3 and Figure 4, respectively. The most common types of MRPs identified were drug-drug interactions (29.0%), typically multi-drug potential interactions, and DGIs (24.6%). The majority of patients (n = 44, 88%) had at least 1 DGI, with 17 patients (34%) having ≥4 DGIs (range, 4 to 10). Statins were the most common class of drugs involved in a DGI (13.4%), followed by antidepressants (12.8%), proton pump inhibitors (12.8%), β-blockers (10.1%), anticoagulants (9.4%), opioids (7.4%), antidiabetics (6.0%), antiplatelets (4.0%), calcium channel blockers (3.4%), and sedative hypnotics (3.4%). The most frequent recommendations made were to monitor the patient (n = 38; 27.5%) and start alternative therapy (n = 35; 25.4%). Based on returned consults, the majority of the research pharmacist’s recommendations (n = 80; 90.9%) were accepted by the PCPs (Figure 4). Types of medication-related problems identified by the pharmacist (N = 138). While performing consults, the pharmacist identified a total of 138 MRPs for the 50 patients enrolled onto the study. The most common types of MRPs identified were drug-drug interactions (29.0%), such as competitive inhibition involving 2 drugs (eg, metoprolol interfering with oxycodone activation) and multi-drug combination (eg, metoprolol and atorvastatin interfering with mirtazapine clearance), and DGIs (24.6%), such as inability to activate clopidogrel to its active metabolite and poor statin uptake into the liver. Abbreviations: ADR, adverse drug reaction; DGI, drug-gene interaction; MTM, medication therapy management; MRP, medication-related problem. Types of recommendations made by the pharmacist (N = 138) and physician acceptance rates. For each MRP identified (N = 138) as part of the consult, the pharmacist made a recommendation for the PCP to resolve the MRP. The most frequent types of recommendations made were to monitor the patient (n = 38; 27.5%) and start alternative therapy (n = 35; 25.4%). Examples of monitoring recommendations included monitor for ADRs from nebivolol due to decreased CYP2D6 isoenzyme activity and monitor for side effects from mirtazapine due to multi-drug competitive inhibition. Examples of recommendations to start alternative therapy included switch clopidogrel to an alternative antiplatelet with a different metabolic pathway (eg, prasugrel or ticagrelor) due to a DGI and decrease dose of simvastatin or switch to an alternative statin (eg, rosuvastatin or pravastatin) due to a DGI. The majority of the pharmacist’s recommendations (90.9%) were accepted (ie, accepted or accepted with changes) by the PCPs. Abbreviations: ADRs, adverse drug reactions; DGI, drug-gene interaction; MTM, medication therapy management; MRP, medication-related problem; PCPs, primary care physicians. The turnaround time for the PGx test results to be completed by the laboratory and returned to the research pharmacist was 5.8 (± 2.2) days. The results of PGx testing, specifically the phenotype distribution of the genes tested for the 50 patients enrolled in this study, are depicted in Figure 5. All patients had at least 1 genetic variant, and the majority (66%) had at least 5. Notably, among the genes tested, 36% of patients were identified as rapid metabolizers for the CYP2C19 isoenzyme; 40% were considered intermediate or poor metabolizers for the CYP2D6 isoenzyme; 30% were determined to have reduced activity for the SLCO1B1 transporter; and 50% and 14%, respectively, were identified as having reduced and significantly reduced VKORC1 activity. Phenotype distribution of the genes tested in 50 patients. All 50 patients who underwent PGx testing had at least 1 genetic variant, and the majority (66.0%) had ≥5. Notably, among the genes tested, 36.0% of patients were identified as rapid metabolizers for the CYP2C19 isoenzyme; 40.0% were considered intermediate or poor metabolizers for the CYP2D6 isoenzyme; 30.0% were determined to have reduced activity for the SLCO1B1 transporter; and 50.0% and 14.0%, respectively, were identified as having reduced and significantly reduced VKORC1 activity. (Reduced and significantly reduced refer to intermediate and poor phenotypes respectively as shown in the figure.) *Thrombosis profile included testing the following genes: F2, F5, MTHFR (A1298C), and MTHFR (C677T). Abbreviations: PGx, pharmacogenomics; CYP, Cytochrome P450. Professional pharmacy organizations and other experts in the field have proposed the integration of PGx testing into MTM to enable further refinement of medication management to identify ineffective and/or harmful drugs or drug combinations.38,40⇓⇓⇓⇓⇓–46 Few studies to date have assessed the feasibility and value of integrating PGx testing into MTM in clinical practice, and most have been pilot studies or surveys.29⇓–31,41,47⇓–49 In our study, we found that enhancing MTM services by integrating PGx testing and pharmacist interpretation is not only feasible in the primary care setting, but also allows the pharmacist to successfully identify additional MRPs that should be addressed with the patient’s PCP. The implementation of this pharmacist-led service was not without its challenges. However, in this particular setting, we were able to overcome most of the challenges that early integrators of PGx into MTM encountered before us.29⇓–31,41,47⇓–49 We share these experiences—challenges and solutions—so that others may consider them when initiating a similar service. First, the primary care office has electronic health records, but was not capable of interacting with our clinical decision support software, thus data had to be manually entered into the system to assess patient’s medication-related risks. This was an expected challenge because there was not an investment in technology development. We overcame the lack of system interoperability by handling the service similar to a consult service; the research pharmacist was on site for a significant portion of time, but completed the consults off site and used secure electronic communication to exchange consult information. This method reportedly worked well for the PCPs with whom the research pharmacists worked. If this type of MTM service is desired in a more prospective manner, it would be beneficial to implement interoperable technology to allow PCPs to use the CDSS and facilitate better communication and workflow. Second, patients must be willing to undergo PGx testing in order for this type of service to be implemented. Although the majority of eligible patients elected to enroll in our study, most patients who opted not to enroll indicated that they did not have sufficient time to participate in the informed consent process. Although informed consent was a legitimate challenge, it may not be applicable to other primary care settings interested in implementing a similar service because we were involved in a formal research study while others may implement this service as a part of standard clinical care, thereby potentially bypassing the informed consent process. Further, as we expected going into the study, most patients seemed to have insufficient understanding of PGx and appreciation of its benefits. The research pharmacist spent an appreciable amount of time (30 to 40 minutes) educating patients about PGx and the benefits and risks associated with testing. The time seemed to be well spent, given that the majority of patients (54%) consented to PGx testing and agreed to participate in the study once they learned more about PGx. As demonstrated by other studies,31,32 this finding suggests that patients empowered with knowledge about PGx are receptive to undergo PGx testing, which could improve their medication management. Further, this indicates that either prescribers need to have sufficient time to educate patients on PGx before testing, or will need to implement a consult-based service, such as ours, and allow a pharmacist to provide this education. Last, with regard to PGx testing, we were somewhat challenged with the turnaround time. Specifically, it took approximately 3 to 7 days for the research pharmacist to receive PGx test results back from the laboratory. Although this is a reasonable turnaround time to expect for integrating PGx test results into MTM services, as reported by others,29,31,47,54 this delayed the time before the research pharmacist could start the consults. In the future, consults may be able to be started and then modified once genetic results are received, depending on prescribers’ preferences. In conclusion, implementing a clinical pharmacist-led MTM Plus service in the primary care setting is feasible. This study highlights that DGIs are common in older adults in family practice and indicates that PGx testing identifies additional MRPs that may otherwise go unnoticed in these patients. The experiences we shared can aid other clinicians in establishing successful MTM Plus services. Future studies should also measure the impact of such personalized medicine services on economic, clinical, and humanistic outcomes. This article was externally peer reviewed. Funding: Funding was provided by Tabula Rasa HealthCare. Conflict of interest: EJS, JT, OVK, CHK, and KTB, as stakeholders in Tabula Rasa HealthCare, have financial interests in the proprietary, clinical decision support system the company has developed (Medication Risk Mitigation Matrix). JP, PP, HS, and AMI have nothing to declare. To see this article online, please go to: http://jabfm.org/content/30/6/701.full. Received for publication April 4, 2017. Revision received July 17, 2017. Accepted for publication July 31, 2017.
. The future of genomic testing in primary care: the changing face of personalized medicine. Per Med 2014;11:477–486.
. Determinants of the range of drugs prescribed in general practice: A cross-sectional analysis. BMC Health Serv Res 2007;7:132.
. Drug-related problems: Their structure and function. DICP 1990;24:1093–1097.
. Adverse drug events in ambulatory care N Engl J Med 2003;348:1556–1564.
. Inappropriate medication prescribing for elderly ambulatory care patients. Arch Intern Med 2004;164:305–312.
. Adverse drug events in the outpatient setting: An 11-year national analysis. Pharmacoepidemiol Drug Saf 2010;19:901–910.
. Systematic review of the incidence and characteristics of preventable adverse drug events in ambulatory care. Ann Pharmacother 2007;41:1411–26. U.S. Department of Health and Human Services, Office of Disease Prevention and Health Promotion. National Action Plan for Adverse Drug Eevent Prevention. Washington, DC; 2014. Centers for Medicare & Medicaid Services. Medicare Program; Medicare Prescription Drug Benefit. 42 CFR §400, 403, 411, 417, 423. Available from: https://www.federalregister.gov/documents/2005/01/28/05–1321/medicare-program-medicare-prescription-drug-benefit. Published January 28, 2005. Effective March 22, 2005. Accessed September 21, 2016. Avalere Health. Exploring Pharmacists Role in a Changing Healthcare Environment. Washington, DC; May 2014.
. Evidence of the economic benefit of clinical pharmacy services: 1996–2000. Pharmacotherapy 2003;23:113–132.
. Effect of a pharmacy care program on medication adherence and persistence, blood pressure, and low-density lipoprotein cholesterol: A randomized controlled trial. JAMA 2006;296:2563–2571.
. Effects of a home-based intervention among patients with congestive heart failure discharged from acute hospital care. Arch Intern Med 1998;158:1067–1072.
. Reduction in heart failure events by the addition of a clinical pharmacist to the heart failure management team: Results of the Pharmacist in Heart Failure Assessment Recommendation and Monitoring (PHARM) Study. Arch Intern Med 1999;159:1939–1945.
. Impact of pharmacist interventions on hospital readmissions for heart failure. Am J Health Syst Pharm 1999;56:1339–1342.
. Impact of the clinical pharmacist on readmission in patients with acute coronary syndrome. Ann Pharmacother 2005;39:1423–1427.
. Pharmacist interventions to improve the management of coronary artery disease. Am J Health Syst Pharm 2004;61:2672–2678.
. Patient adherence and medical treatment outcomes: A meta-analysis. Med Care 2002;40:794–811.
. Medication therapy management services: Definitions and outcomes. Drugs 2009;69:393–406.
. Medication therapy management: 10 years of experience in a large integrated health care system. J Manag Care Pharm 2010;16:185–195. , eds. Medication therapy management in chronically ill populations: Final report. Baltimore, MD: Centers for Medicare & Medicaid Services; 2013 Aug. Contract No. HHSM-500-2011-00012I/TOT0001. U.S. Department of Health and Human Services, Centers for Medicare & Medicaid Services. Announcement of part D enhanced medication therapy management model test. Baltimore, MD. September 28, 2015.
. Primary care-based, pharmacist-physician collaborative medication-therapy management of hypertension: a randomized, pragmatic trial. Clin Ther 2014;36:1244–1254.
. Medication therapy management in the primary care setting: A pharmacist-based pay-for-performance project. J Pharm Pract 2012;25:89–95.
. Impact of live medication therapy management on cholesterol values in patients with cardiovascular disease. J Am Pharm Assoc (2003) 2014;54:526–529.
. Evaluation of pharmacists’ work in a physician-pharmacist collaborative model for the management of hypertension. 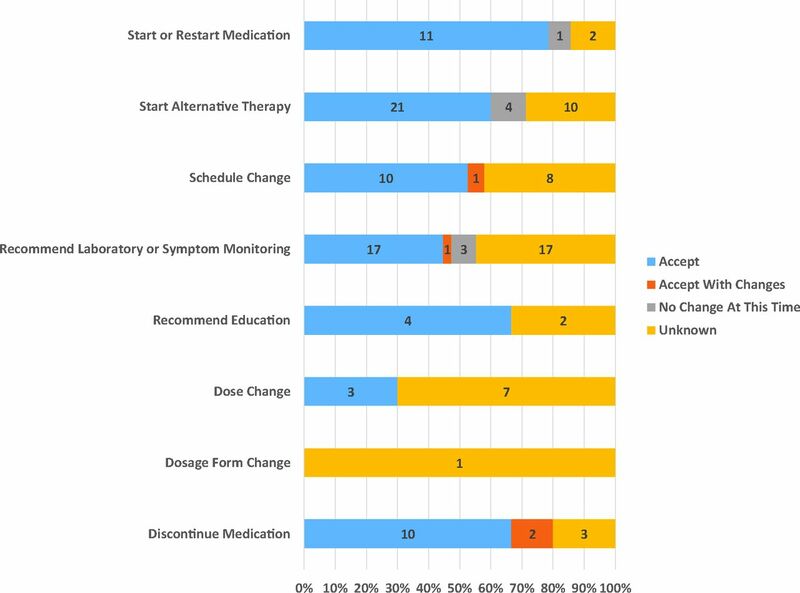 Pharmacotherapy 2016;36:374–384.
. Development and implementation of a postdischarge home-based medication management service. Am J Health Syst Pharm 2014;71:1576–1583.
. Implementation of a medication reconciliation process in an ambulatory internal medicine clinic. Qual Saf Health Care 2007;16:90–94.
. Community pharmacists’ experience with pharmacogenetic testing. J Am Pharm Assoc (2003) 2015;55:587–594.
. Pilot study of pharmacist-assisted delivery of pharmacogenetic testing in a primary care setting. Pharmacogenomics 2014;15:1677–1686.
. Implementation of a pharmacogenomics service in a community pharmacy. J Am Pharm Assoc (2003) 2014;54:172–180.
. Feasibility of pharmacy-initiated pharmacogenetic screening for CYP2D6 and CYP2C19. 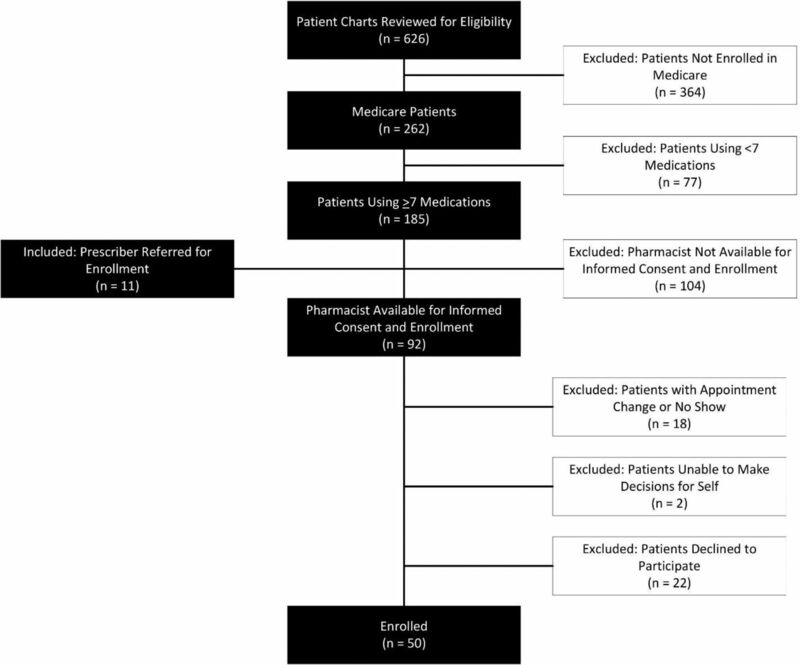 Eur J Clin Pharmacol 2012;68:363–370.
. Concurrent and predictive validity of a self-reported measure of medication adherence. Med Care 1986;24:67–74.
. Medication risk mitigation: Coordinating and collaborating with health care systems, universities, and researchers to facilitate the design and execution of practice-based research. Clin Geriatr Med 2017;33:257–281.
. American Diabetes Association standards of Medical Care in Diabetes 2017. J Diabetes 2017;9:320–324.
. 2013 ACCF/AHA guideline for the management of heart failure: A report of the American College of Cardiology Foundation/American Heart Association Task Force on Practice Guidelines. J Am Coll Cardiol 2013;62(16):e147–e239.
. 2016 ACC/AHA/hfsa focused update on new pharmacological therapy for heart failure: An update of the 2013 ACCF/AHA Guideline for the management of heart failure: A report of the American College of Cardiology/American Heart Association Task Force on Clinical Practice Guidelines and the Heart Failure Society of America. J Am Coll Cardiol 2016;68:1476–1488.
. CPIC: Clinical pharmacogenetics implementation consortium of the Pharmacogenomics Research Network. Clin Pharmacol Ther 2011;89:464–467.
. Insights from exemplar practices on achieving organizational structures in primary care. J Am Board Fam Med 2015;28:190–194.
. Integrating pharmacogenomics into pharmacy practice via medication therapy management. J Am Pharm Assoc (2003) 2011;51:e64–e74.
. Incorporation of pharmacogenetic testing into medication therapy management. Pharmacogenomics 2015;16:1931–1941.
. Pharmacogenetic testing and therapeutic drug monitoring are complementary tools for optimal individualization of drug therapy. Eur J Clin Pharmacol 2010;66:755–774.
. Pilot study: Incorporation of pharmacogenetic testing in medication therapy management services. Pharmacogenomics 2014;15:1729–1737.
. Therapeutic drug monitoring and pharmacogenetics interface considerations. In: Valdes R, Payne DA, Linder MW, eds. Laboratory medicine practice guidelines: Guidelines and recommendations for laboratory analysis and application of pharmacogenetics to clinical practice. Washington, DC: National Academy of Clincal Biochemistry; 2010; 29–33. ASHP statement on the pharmacist’s role in clinical pharmacogenomics. Am J Health Syst Pharm 2015;72:579–581.
. Incorporation of pharmacogenomics into routine clinical practice: the Clinical Pharmacogenetics Implementation Consortium (CPIC) guideline development process. Curr Drug Metab 2014;15:209–217.
. Development and implementation of a pharmacist-managed clinical pharmacogenetics service. Am J Health Syst Pharm 2011;68:143–150.
. Delivering pharmacogenetic testing to the masses: An achievable goal? Pharmacogenomics 2014;15:1–4.
. Exploratory planning and implementation of a pilot pharmacogenetic program in a community pharmacy. Pharmacogenomics 2012;13:955–962. US Food and Drug Administration. Table of Pharmacogenomic Biomarkers in Drug Labeling. Available from: https://www.fda.gov/Drugs/ScienceResearch/ResearchAreas/Pharmacogenetics/ucm083378.htm. Accessed June 1, 2017.
. How common are drug and gene interactions? 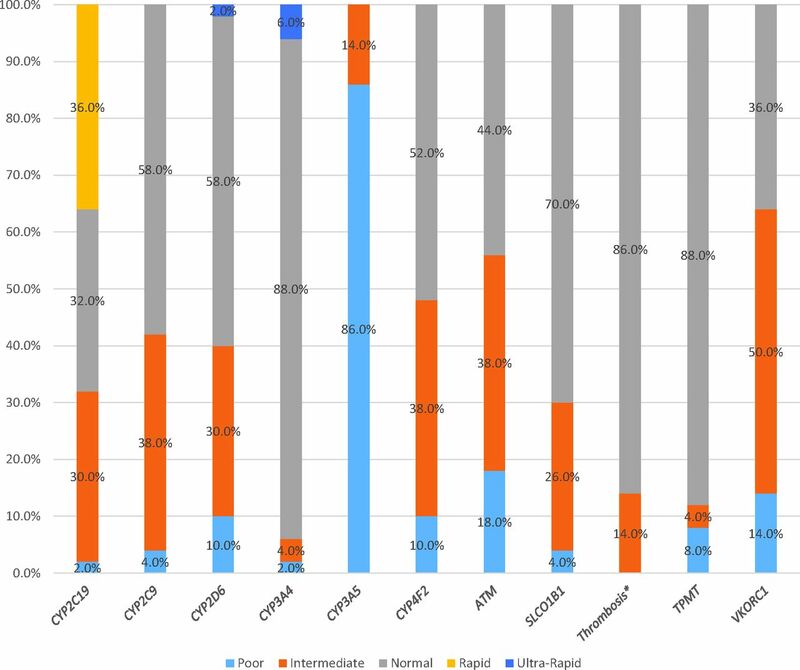 Prevalence in a sample of 1143 patients with CYP2C9, CYP2C19 and CYP2D6 genotyping. Pharmacogenomics 2014;15:655–665.
. Cytochrome P-450 gene and drug interaction analysis in patients referred for pharmacogenetic testing. Am J Health Syst Pharm 2016;73:61–67.
. A review of pharmacogenetics of adverse drug reactions in elderly people. Drug Saf 2012;35(Suppl 1):3–20.
. Primary care physicians’ knowledge of and experience with pharmacogenetic testing. Clin Genet 2012;82:388–394.